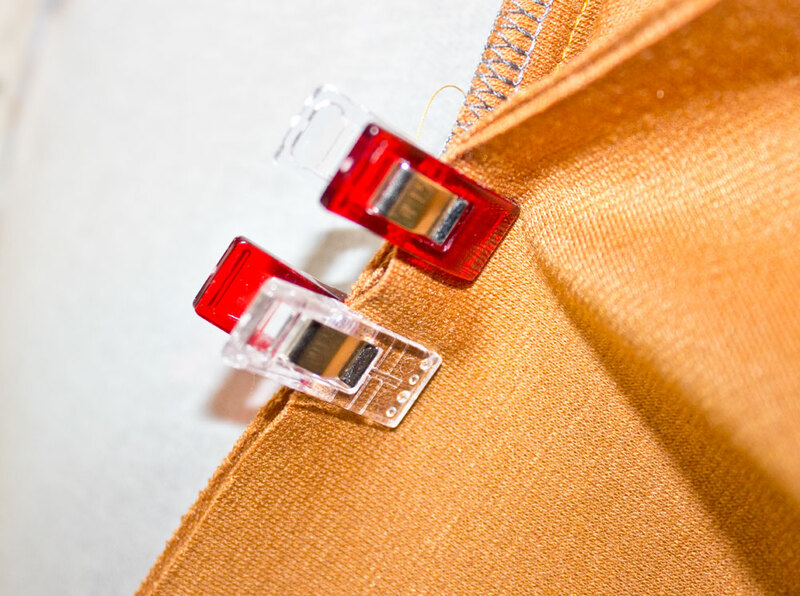 There’s many things I love about the Instagram sewing community and the numerous sewing challenges are just one of them! The latest challenge is the #cosycardichallenge and the timing was perfect as it was at the back of my mind to make a cardigan for the autumn and in a very seasonal colour no less! 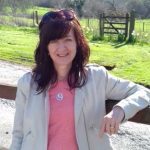 Luckily I knew exactly what style I wanted, I had a rtw long hooded knitted cardigan years ago with big brown toggles, it was a present and while I loved the cardi I didn’t like the beige colour, so didn’t wear it too much. I think it became loungewear before making it’s journey to the charity shop. Anyhow, I researched all the boyfriend style patterns out there (the hosts give full details see end of post) and the Vermont Cardigan by New Horizons Designs looked pretty much how I remembered my old cardigan to be. I’d never heard of the designer but read some good reviews and looked through the photos tagged #vermontcardigan on IG and thought I’d go for it. The pdf pattern was great because you have ‘no trim pages’ and you just overlap the pages where marked, it was a revelation, I’ve never come across not having to trim edges before but was a real time saver. The pattern is sized from XS to 3X (US sizes 00 to 26), I made a size S, I usually wear a UK 8 and the bodice fit was perfect. The first thing to note about this pattern is options, there are lots and lots of them. You can make so many variations using the same pattern pieces, cropped, tunic, V neck or crew, hooded, belted, it’s a really versatile pattern, so you get your money’s worth, the pattern was $11.95 so worked out around £9.50. I decided to go for the hooded, V neck, tunic length option marked bottom left. There’s lots of tips for sewing with knits too which is great if you’re like me and haven’t had too much experience working with knit fabrics. There’s also a Facebook group for New Horizons Designs so there’s lots of tips and help available if you need it! I actually decided to do a toile of the cropped crew neck version to get an idea of construction and sizing in some cheap jersey knit I had in my stash, I’m glad I did because the sleeves were a bit too long and the cuffs a bit snug, and I have what I consider to be long, skinny arms! Oh and I also sewed the sleeve wrong sides together so I had one sleeve with the overlock seams on the outside, I didn’t mind the look of it if only the other seams had matched! The only really tricky bit with this pattern was the point where the hood met with the bodice, the pattern didn’t give any specific instructions on how best to do this, and it was a little awkward to make sure the layers stayed flat, it turned out a little messy inside, especially when I overlocked it and went a bit wonky with my stitching but it is on the inside so I shouldn’t get too pedantic about it! When I make another version of this cardigan I think I will try to use some kind of tape, twill or ribbon to hide the inside seams around the neckline because I am conscious that they’re exposed and it does give a much more professional looking finish but I felt it was a bit beyond me for this make! 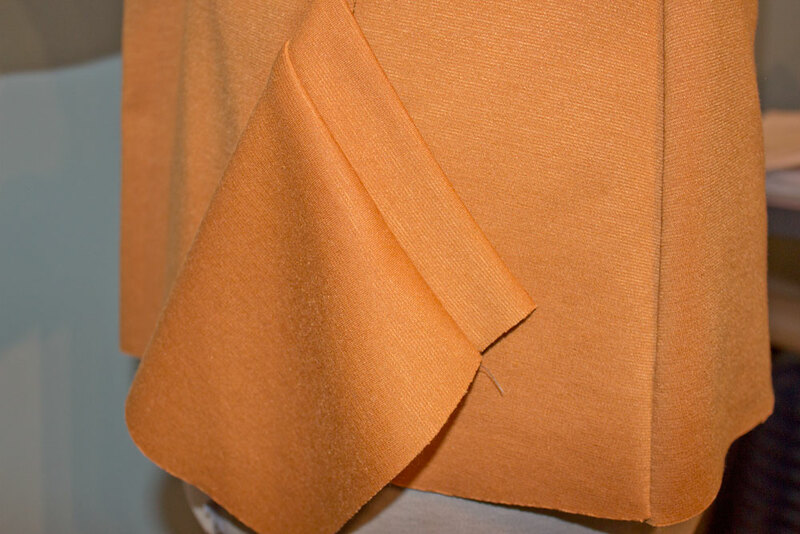 When it came to attaching the binding, I started from each side at the hemline and worked towards the middle of the hood. When I did my toile version I sewed the neckline from one side to the other and the binding was too short or the fabric had stretched out but either way I didn’t want that happening at the bottom hem where it would be noticeable. As it happened my binding was generous so I was pulling the fabric frantically trying to get it to stretch to meet the binding but as it’s at the back of the hood it’s not really noticeable that it’s a bit gathered. After lots of topstitching I was ready to add the buttons and chose some chunky buttons I bought recently at a charity Haberdashery shop. The staff there actually take all the buttons off donations that aren’t fit to be sold and they have dozens of boxes of buttons all colour co-ordinated with many of them being vintage. Last time I was there I sat on the floor and went through all the boxes individually, another lady was doing the same and we commented they should have a coffee machine available and some cushions! What I didn’t give any thought to was what happens when your button is too big for your buttonhole foot? 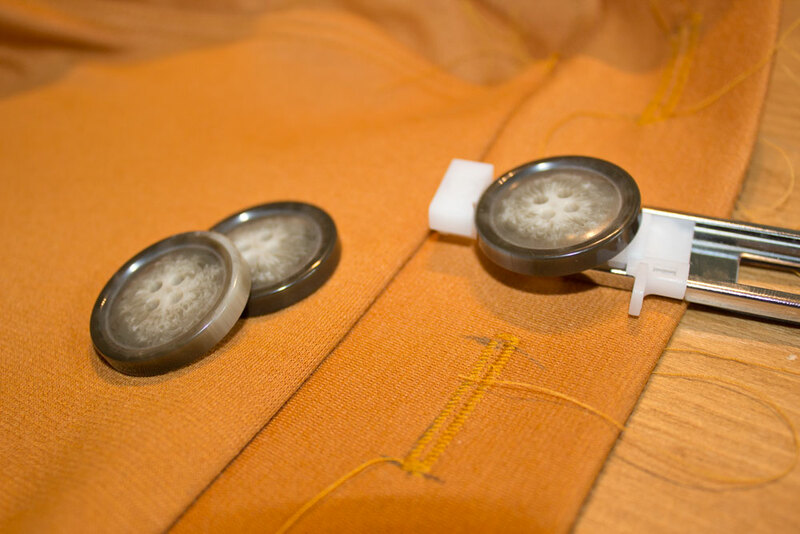 Well mine were and after contemplating having either a buttonless cardigan or learning how to do a manual buttonhole, I thought there must be a way around this by moving the button lever to make it think it had hit the buttonhole foot. A bit of experimenting and it worked, I basically pulled the lever towards me at the point I wanted the stitching to return to the starting point, then pushed it backwards when it reached the starting point. It was a bit tricky to get the stop/start point exact but by buttonhole 5 I got the hang of it, the others needed a bit of tlc to tidy them up but I’m happy enough with the result. I also used my regular presser foot in a clear version which made it easier to see my markings. Im really pleased with the finished cardigan, the hood is definitely just a design feature and unless I get caught short in a downpour I won’t be putting it on! 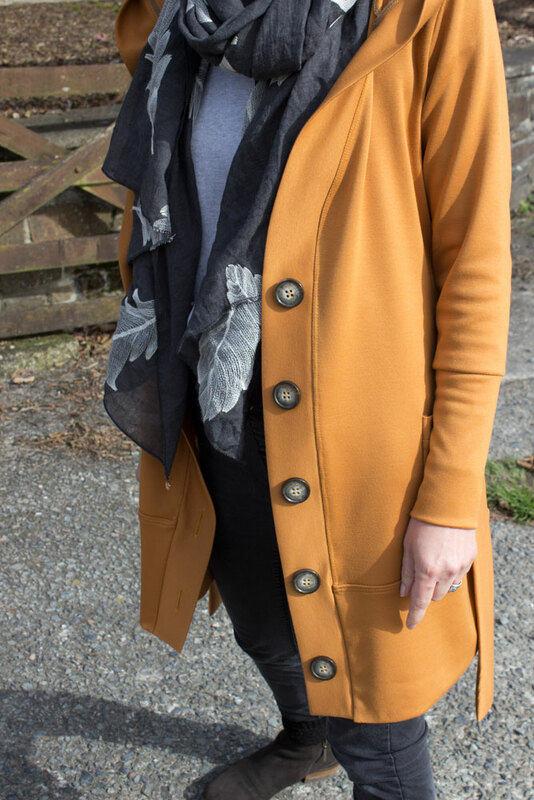 I do wear a lot of grey and black in autumn/winter so this adds a great pop of colour to my otherwise boring wardrobe! If you want to enter the #cosycardichallenge, search the hashtag on IG for full details or check out the post by two of the hosts the Stitch Sisters with details of 64 indie cardigan patterns! 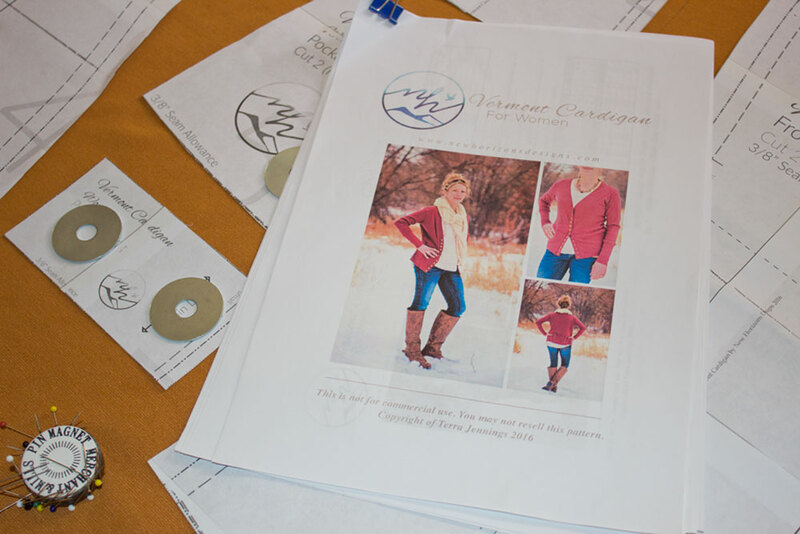 Lots and lots of great inspiration and photos if you’re not sure what style of cardigan you’d like to go for. There’s prizes to be won and the challenge runs to 31 October so plenty of time to make a cardi or two! This entry was posted in Dressmaking, Pattern Review, Patterns, Sewing. 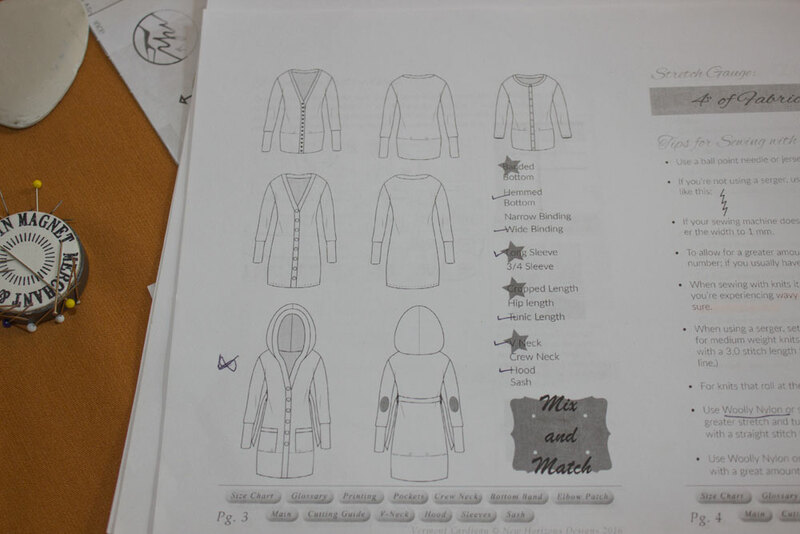 Tagged Cardigan, dressmaking, pattern review, patterns. Looks amazing! I love the fabric colour. Thank you, it’s not my usual palette but I’m loving it too! 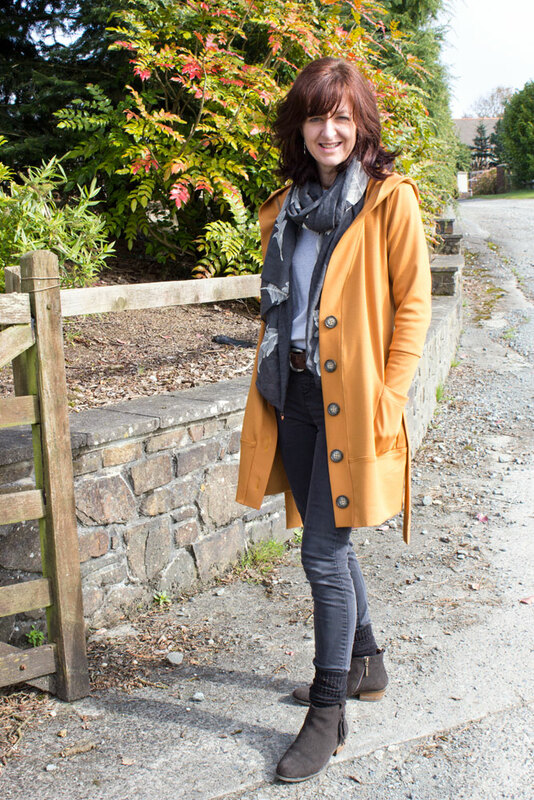 The mustard is so lovely, and a hood is such a smart idea on a cardigan. What a special shop, and those ladies should definitely have some comfy cushions and a coffee maker! I rarely find buttons at the thrift store, but I’m learning to salvage them from shirts that can’t be worn or buy them at the thrift store. Even if I can’t use the fabric, the price of buttons and the quality of them has gone up and down respectively to a point that one has to be creative! Thanks for the inspiration for the challenge! Oh this looks lovely on you, and the colour goes so well with your hair! It looks really cosy as well. SewReady on The Eagle jacket by Vanessa Pouzet, how high this one soars! michele on The Eagle jacket by Vanessa Pouzet, how high this one soars!